You are the Queen of the Ring! What brought me to tears was seeing how young some people are who are stricken with Parkinson’s. They are over 40 years younger than you – it’s so sad, and you seem to be at a lesser stage than some much younger. It really was quite eye opening to me to see all these young people with Parkinson’s. I had no idea how common it was for people under 80 or so…and you’re over 90! 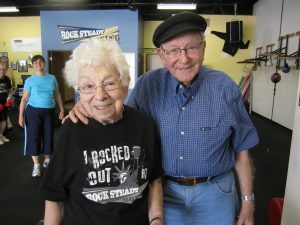 But it made me happy to see that Rock Steady is allowing so many people to continue living the way or close to the way they have been used to living all their lives, through independence and physical fitness. So, thanks for being in this amazing video that really brought all this new knowledge to my eyes about this thing we call Parkinson’s. Can’t wait to see you in the ring over Chanukah!